Classes are about to start, so time to assemble slides on the trade outlook. I put together this graph of US goods exports to and imports from China (would’ve been through November, but for the Federal government shutdown – Jan 8 was release date). Please help me see the victory Mr. Trump keeps on talking about. Conducting seasonal adjustment with discrete structural breaks is a hazardous enterprise, so I have plotted the original seasonally unadjusted series as well. It looks a serious dropoff in US exports to China is continuing into October. Of course, this is a stupid metric (see here). If any trade balance matters, it’s the overall, not a bilateral. See also Brad Setser’s discussion of November stats. Chinese December stats recounted in this SCMP article. This entry was posted on January 22, 2019 by Menzie Chinn. More seriously, I don’t know, I think it’s still worthy to look at. Couldn’t looking at bilateral give a technocrat some ideas on GVC strategies if your government was so inclined?? But 98% you are right, I mean, it’s stupid just to compare to one country, I agree. But it’s politically useful to single out “baddies” because you can’t demonize the ENTIRE world. Unless…… Sorry I just had a CCTV flashback. What were we talking about again??? I keep forgetting to check Brad Setser’s stuff on this and I even subscribe to his newsletter. That’s not just blog reader negligence, I should be charged with blog reader malpractice. The reality is nearly ALL of these agencies are important, and there’s a lot of them. Even some of the crappiest government agencies going may have only 1 function they perform out of 20 useless ones that is important for society to function. The FDA and USDA fall under that category. Yes some of it is useless, but do you wanna trust a private company to make sure your beef, pork, chicken, and dairy is clean?? Personally I’d like to see at least one person check. You know when I buy salmon at the store it says right on the package they use dye (I assume pink) to make the salmon look fresher. That doesn’t exactly “inspire confidence” in freshness. It is a shame that the Trump shut down prevents us from seeing the latest numbers. Maybe he has been told exports have fallen even more – which would explain his refusal to sign a bill that would end this mess. All about keeping Ann Coulter happy. It would seem to be easier to check the unadjusted figures than the adjusted figures for the unwashed, like me. Show both the Uncertainty Index for US and China, Current Accounts and Reserves to students, Menzie. Maybe along with those of Germany, Netherlands, Korea. And the countries’ long-term interest rate movement. Just show them all the figures. Zi Zi: Once everything is important, nothing is. Also, I don’t have infinite time to download, format, publish. This is not my day job. Have you ever taught a class? Written a research paper or a book? What you are suggesting here is to overwhelm people with mass confusion. Oh wait – that’s your goal. Got it! I feel good about Zi Zi’s post, because I finally found another commenter here who pesters and bedevils Professor Chinn more than I do, and it makes me feel slightly less guilty. Thanks Zi Zi, I needed that. Menzie must get a light-hearted chuckle out of his readers’ silliness (laziness??) sometimes. And I include myself in that group that he must laugh at sometimes. I mean the Setser article (and I am sure there are other good ones) breaks down a lot of the data they whine Menzie does not put up, and in fact Menzie has put signposts up pointing to Setser multiple times on this blog. Again, I am also including myself in this criticism, I am as guilty as anyone on this misdemeanor, but damn people, Menzie isn’t going to come to your house and click the mouse button or the touchpad for you. You know sometimes you might have to do that on your own. Or better yet if you have data that refutes his, why don’t you put it up your own damned self, instead of implying a contradictory story that often times doesn’t exist. Are you that lazy? ?—or like trump you really don’t want to know what January 8 says anyway. Lawmakers in Russia, which has close relations with Venezuela, are sharply critical of U.S. President Donald Trump’s recognition of an opposition politician who has declared himself the country’s legitimate interim president. “I think that in this developing situation the United States is trying to carry out an operation to organize the next color revolution in Venezuela,” the deputy chairman of the foreign affairs committee of the upper house of parliament, Andrei Klimov, told state news agency RIA-Novosti. “Color revolution” is a Russian term for the popular uprisings that unseated leaders in Georgia, Ukraine and Kyrgyzstan. “I do not think that we can recognize this — it is, in essence, a coup,” another committee member, Vladimir Dzhabrailov, was quoted as saying by the Interfax agency. Russia is a major political ally of Venezuela, and Russia’s largest oil company, Rosneft, is heavily invested in the South American nation’s oil fields, which produce less crude each month. Then find the data and share with us. I did. Turned out to be easier than I thought. See https://fred.stlouisfed.org/tags/series?t=china%3Bimports%3Bmonthly. Apparently, total Chinese imports don’t show any comparable decline, at least as of October 2018. You got to love it. Zi Zi and this dude were demanding that Menzie show more data. 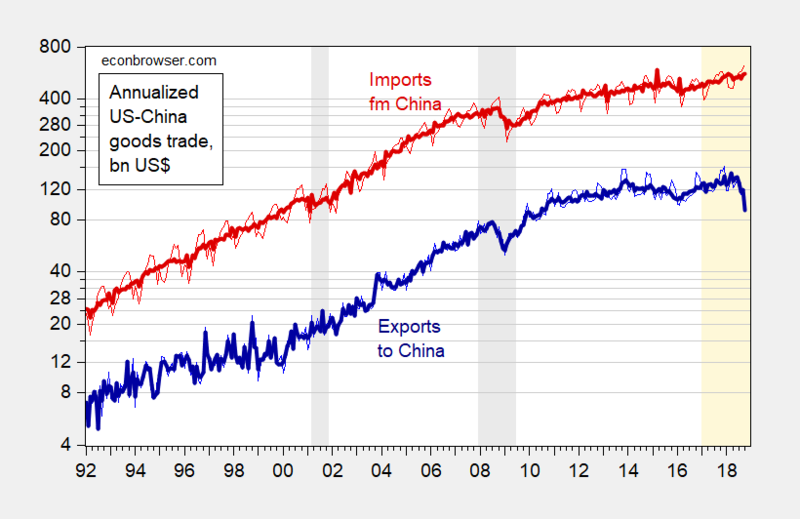 Of course his graph already showed China’s imports from us. Fellows – learn to read a graph. If that blogger (and dilettante of California economics) reads that Axios link, he will NOW know what an “enemies list” truly is, and we can say for the first time ever that donald trump has performed an act of edification of a human being.